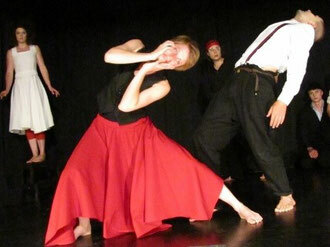 With the professional mime / physical theatre training the MimeCenter Cologne is forming a new generation of mimes. During the fulltime – training the students are working on competences in physical theatre – mainly focused on the corporeal mime of Etienne Decroux: technique, improvisation, composition and repertoire. To complete this strong focus other subjects are also taught – such as improvisation / actor´s training (after Jacques Lecoq), classical pantomime (Marcel Marceau), theatre mask (neutral and character masks) and dance (Ballet, Laban). Particularly important is the body work. With a special training for performers we are developing the basics of modern body – and motion studies. For the scenic play the body develops his precision of the technique as well as playfully through recreational play and motion fantasy. At the end of the study the students will have the artistic and physical skills to be able to realize successfully their ideas and projects – as a performer, director, composer, teacher and author for contemporary physical theatre. Technique, improvisation, composition and repertoire. During the 1st year of training they get to know the basics of classical and contemporary mime, they increase their physical possibilities and are lead to the physical play. During the 2nd year the students expand their technical knowledge. Besides the learning of repertoire pieces (Decroux, Leabhart, Wasson), they will create their own pieces. Students, who are successfully completing the 1st period and passing the examen (Technique, repertoire and creation), are getting a diploma in Mime / Physical Theatre. In a possible 3rd year of training technique and repertoire will be further deepened. The focus in this additional year will be on directing and teaching physical theatre. The students will learn pedagogical skills - theory and practice. Main focus in this year of education is the creation of his (or her) own show - duration at least 30 minutes. With assistance of the teachers every student will create an individual show (solo or duo). This can be a clowns-show, a mask play, a dramatic theatre piece, a programme of dance theatre, a circus show…. there is a large range of possibilities, which is depending on the individual skills and wishes of every single performer. Ar the end of each school year there will be a presentation in a theatre in Cologne. There will be given 15 - 18 teaching units (each 45 minutes) per week – given on 4 days (depending on the number of students). Additionally the students should work on their own at the school – at least 5 hours per week. Therefore they can use the classroom on 2 afternoons of the week. The studytime finishes ~ 14h. The MimeCenter Köln proposes a 2 - 3 years full time education in mime and physical theatre. To enter into this course you have to attend an audition workshop. During this workshop the teachers of the school will testify the ability of the potential student to the education/training. If you are not able to attend the audition workshop because you live outside Germany, please send us the application documents (see below) and a video/dvd, where you tell s.th. (as possible in German, English or French - Italian or Spanish also possible) about yourself and your motivation to join the school and please show us a short presentation of a personal work (3 – 5 minutes). The audition workshop consists in a class with other students training, improvisation, and a short interview with teachers of the school. Besides of physical fitness (flexibility, coordination, strength) we set a high value on imagination, sensibility and capability of play and expression. No previous experience in mime is necessary. People having a strong knowledge in Corporeal Mime are welcome to audition for the 2nd or 3rd year.